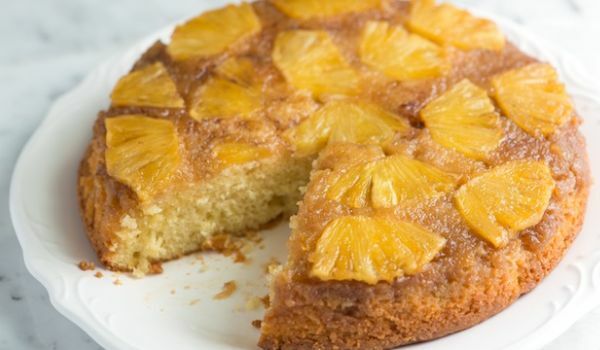 Pineapple has more benefits to offer than what you can think of. Move over the usual chocolate flavored cakes and try a dessert made using this fruit. Mix flour, baking powder, baking soda, salt and sugar in a bowl. Heat the pineapple juice in a saucepan to lukewarm temperature. Put a small quantity of crushed pineapple in pineapple juice. Add vegetable oil, vanilla and vinegar to the mixture of flour, baking powder, baking soda, salt and sugar. Pour lukewarm pineapple juice into the above mixture immediately. Now beat the whole mixture. Preheat the oven at 350 F for 10 minutes. Pour the whole batter into a pan. Heat it for 30 minutes at 350 F.
For Icing, mix flour, powdered ginger and milk in a saucepan. Cook the mixture at medium heat, stirring it constantly. Heat the mixture until it converts into thick paste. Let the mixture cool to lukewarm. Mix butter, cream and crushed pineapple in a bowl. Put the lukewarm paste, salt and icing sugar in the mixture of butter, cream and crushed pineapple. Beat it until it becomes fluffy. Refrigerate it for an hour for firming up the icing. Keep the icing now on the cooled cake. I tried the icing recipe and it turned out to be a complete disaster. My flour mixture did not convert into a paste but was just lumpy and when combined with the cream mixture looked horrible. Is the quantity of flour correct? Waw nice cake, anyway for h0w l0ng can i st0re it?